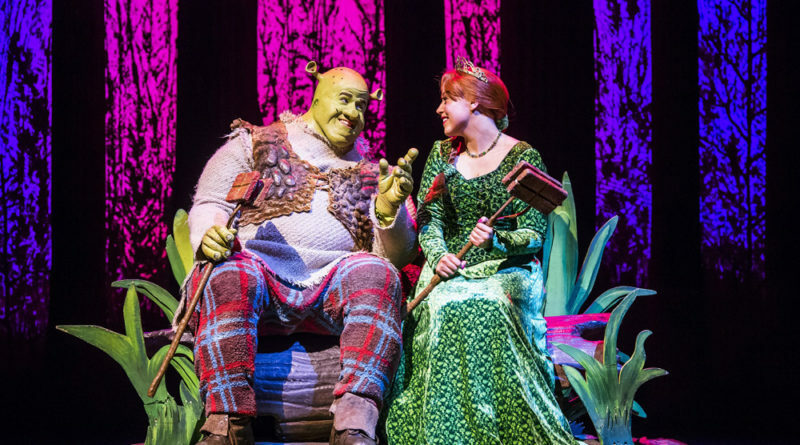 Fiona Trim reviews Shrek the Musical, playing at The Bristol Hippodrome until Sunday 19 August. The story of Shrek The Musical is that of the much-loved animated film, but this stage version has its spiritual home in panto, and (while I cannot imagine how that goes down in other parts of the world) for a British audience whose theatre-going experiences usually begin with pantomime it’s a happy place to be. 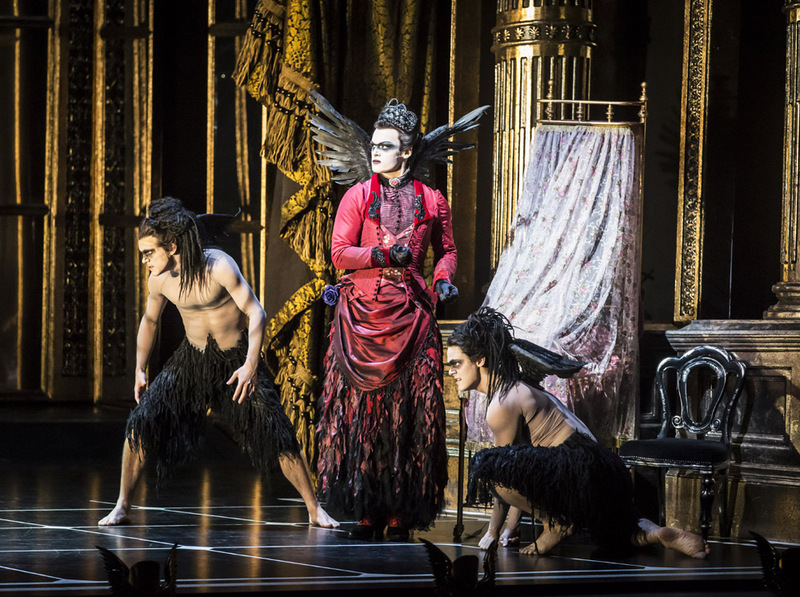 All the familiar elements are there: the fairy tale characters, the traditional cut-out scenery of forests and castles, and the slightly incongruous and completely over the top musical numbers topped with plenty of stupid visual gags and innuendo. I enjoyed the storybook prologue which introduced Shrek and Fiona via their backstories but found that the choice not to follow it with a big production number meant the show seemed to take a little while to pick up energy. This may have been because the role of Shrek, whose solo number opens the show, was performed in a last-minute cast change by understudy Michael Carolan, who seemed a little hesitant at times. 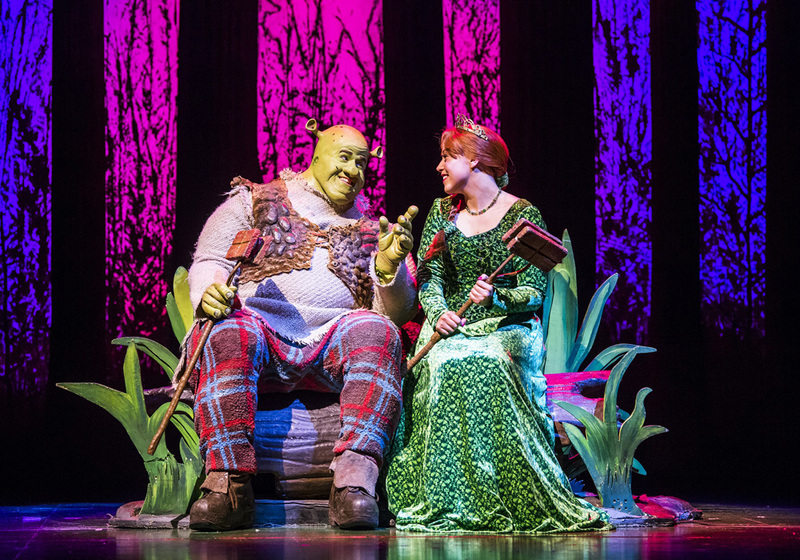 But it was also typical of the fact that often Shrek and Donkey (Marcus Ayton) have the less colourful narrative scenes, pushing the plot forward downstage of the front cloth before the next big musical set piece is revealed. And when they arrive the big musical set pieces are great! The music itself isn’t particularly ground breaking or memorable (and contains very little of the film’s soundtrack) but the performances and staging are consistently impressive, visually engaging and full of energy and wit. The bright colours and irreverent asides are very much in the spirit of the original film, particularly in the two ensemble numbers featuring the fairy tale characters living in Shrek’s swamp. The appearance of the Dragon (Lucinda Shaw) is a highlight both dramatically and vocally, and (for me anyway) Lord Farquaad (Samuel Holmes) and his Pythonesque knights provided real belly-laughs. Farquaad’s short stature is ingeniously portrayed and then milked for jokes to the absolute limit and beyond, which I never stopped finding funny. It is the humour and spectacle that I really enjoyed about the evening, the story and characters being too familiar to create much narrative drive. Having said that, the development of Princess Fiona (Amelia Lily), as she abandons her designated fairy tale role and embraces her true self, struck me more than I remember from the film and made her come across as the most three dimensional of the characters. But I think it’s fair to assume that the majority of audience members will be arriving, as I did, expecting a lively and entertaining version of an already well loved story and, like me, they won’t go away disappointed.